Kanchipuram, in Tamil Nadu, is a famous temple town forty-seven miles southwest of Madras. It was the capital city of the Pallava Empire, in the latter part of the first millennium AD, and then became part of the Chola and Vijayanagar Empires. Kanchipuram produces brocaded silks of superb texture, color and luster. As in many weaving centers, the workers say that the weaving of silk developed from that of weaving cotton through a series of intermediate stages. The raw mulberry silk used is brought in from Bangalore, which has ideal climatic conditions for the rearing of mulberry silk worms. Zari threads for brocading come from Surat in Gujarat. The dull raw silk yarn is washed in the waters of Kanchipuram. It is this water which gives Kanchipuram silk its lustrous sheen. 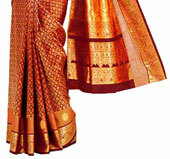 The main items of production are the silk saris with the solid brocade work. The silk is woven on a throw shuttle pitloom with a drawboy harness. Designs and patterns are woven with extra warp and weft, and are worked into the body of the fabric by means of an indigenous device known as the adai, which fulfils the same function as the Jacquard. Kanchipuram saris in the south Indian style have a pallav and/or borders that contrast in colour to the main field of the sari. Although methods of weaving are traditional, Kanchipuram textiles have attained their current status by always keeping pace with changes in popular preference and taste. It is in this capacity that the role of the Weaving Service Center set up at Kanchipuram by the All India Handicraft Board has become vital. Tamil Nadu has a very strong cotton handloom industry organized into co-operatives. Cotton lungis and yardage, mainly in checks, are woven in villages all over Tamil Nadu. Ami is known for its hand-woven textiles, Madras, Thanjavur and Madurai are centres for hand-printed textiles and Madurai also for tie-and-dye work. The towns of Salem, Erode and Kumbakonam are centres for both hand-woven and hand-printed cloth. Applique hangings, banners and decorations for temple carts used to be made in and near Thanjavur. Felt materials, or velvet, were appliqued to a cotton background and the appliquéd patterns were then edged with cotton cords. The background colour was usually red, with pieces of cream, green, yellow and black cloth being used for the appliqued pieces. The central motifs were usually of Ganesh, Lakshmi or other deities surrounded by floral motifs. Appliqued clothes are now prepared in the Thanjavur-Madurai, to be sold mainly to the tourist market. The Todas of the Nilgiri hills around Ootacamund are a small tribe, very different in both appearance and customs to the surrounding Tamil communities. Both men and women wear a shawl of white cotton, usually about nine yards long, called a putkulli. The end of this shawl has two woven bands of either red and black or red and indigo blue. Toda women embroider geometric designs between these two bands to give the shawl a striking pallav. The embroidery is worked by counting threads and follows the warp and weft threads of the material, giving the impression that the patterning is achieved through weaving rather than by embroidery.